Life was busy last weekend. We're a bit off our 'normal' routine, which I suppose can be nice, being forced out of a comfort zone, but at the same time, I'm feeling... disconcerted lately. Things seem very up or very down. Good or bad. No nice middle ground. And not just in the kitchen. One bad thing, a non-kitchen 'down,' is that the stink bugs have returned. They like to congregate on our kitchen windows and they somehow sneak their way between the screen and window, so I cannot open the window because then they'll be in the house. A few gorgeous days and I couldn't open the windows! Then there is the sudden wasp invasion. Last week, I battled one in my bathroom. Those guys are hard to kill! I was afraid to shower with the wasp hovering around the window. Then last night we had 2 in our living room. I have no idea where they are coming in from. I had the living room windows open since the stinkies were on the kitchen windows (but for some reason they don't hang out on the living room windows) and we're wondering if the wasps came in through those windows. Anyway, it seems I won't be enjoying the nice, cool, fresh air as fall arrives. Not unless I want to be battling stink bugs and wasps in the house. Usually we have success in the kitchen. Sure, some things just taste better than others, some things are just 'meh' (like the citrus shortbread last Christmas) but I cannot remember too many 'yucks.' The one I do remember is when we made a Chicken Paprika - oh that was yucky. This past weekend, we had another 'yuck' and unbelievably, it was a baked good. A while ago, I caught a wee bit of a Claire Robinson show on Food Network. She made Earl Grey Shortbread Cookies. I love shortbread. I love Earl Grey. Sounded good, although a wee warning bell went off - chopped tea right in the dough? Hmmmm. But I ignored the alarm and we made these cookies. Yucky. That's what I think. I cannot believe these have a 4-5 star rating on the site and that reviewers talk about how great these cookies are. They do have good shortbread flavor, but I couldn't taste any Earl Grey flavor and worse, not all the tea got pulsed into super tiny bits in the food processor and some of the larger tea leaves were like mini twigs when I ate the cookies. It was gross. I have no photos. I meant to take photos the next morning in the bright natural light, but we were so 'yucked' by these cookies that we decided SP should take them to work and see what people at work thought, if they'd even eat them. And they did. I was surprised the cookies vanished. I guess some people like mini twigs in their cookies - ?! Most people said they were good and could see why the tea twigs bothered me. Anyway, we won't be making those again! Last weekend there was birthday cake. Birthday cake is a good thing. Our youngest niece turned one and there was a party to celebrate. The cake was Bethel Bakery cake, my favorite, with kitty cats on top, and those kitty cats were made of icing and I love BB icing. Yum! At the party I also indulged in potato chips & pretzels dipped in a sour cream & bacon dip. And cheese & crackers. A whole bunch of unhealthy food and I sure felt it later on! Later that night, after the birthday celebration, we went to Bocktown for dinner. We had our usuals, and they were, as usual, good. Last Sunday I got to visit with a friend from graduate school. That's a good thing. I hadn't seen him since grad school graduation! A long time ago. He's driving from Annapolis, MD to Monterey, CA with his SO and they detoured to Pittsburgh for a visit. They asked us about the 'famous sandwich' - Primanti's! We gave them directions to Primanti's in the Strip and directions to get on the roads leading north (their next stop was to see friends in Cleveland). After they left we both were hungry, and I had Primanti's on my mind. I'd never had a Primanti's sandwich. So SP went to the one near us and got us some sandwiches. 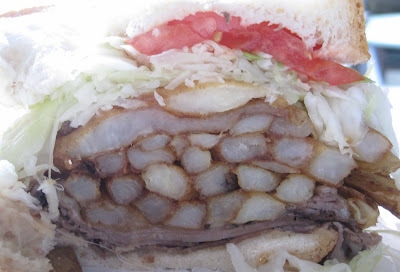 Before I say any more about Primanti's, let me say that I have never liked french fries. Never. Yes, I would sometimes eat them, but I'd never order them, never make them, and usually when they came with a sandwich at a restaurant, I'd give them away. So there's strike one against Primanti's. Strike two: cole slaw. Also something I have not ever enjoyed. With the exception of my grandma's cole slaw, which was finely grated, not shredded, and contained carrot, too, I do not like cole slaw. So why I suddenly wanted to try a Primanti's, I don't know. I guess I suddenly felt ashamed that I grew up here and had never tried one. Thank goodness we ate our sandwiches at home so I couldn't be shamed when I ended up pulling off most of the fries & cole slaw. Look at that! That sandwich is 3 times the size of my mouth! My verdict - well, I liked the beef and cheese and tomato and bread. SP enjoyed his capicola & egg sandwich. 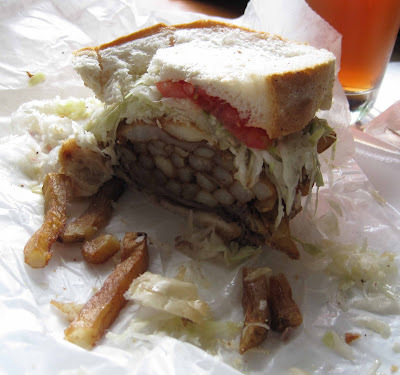 I'm not sure I'll ever want another Primanti's - like I said, I just have never enjoyed fries and slaw, and that's really the point of a Primanti's sandwich. After eating a Primanti's sandwich, neither of us wanted dinner. I think around 7 pm we snacked on some cucumber & tomato. That means that Monday night, we had to cook (instead of re-heat) dinner. 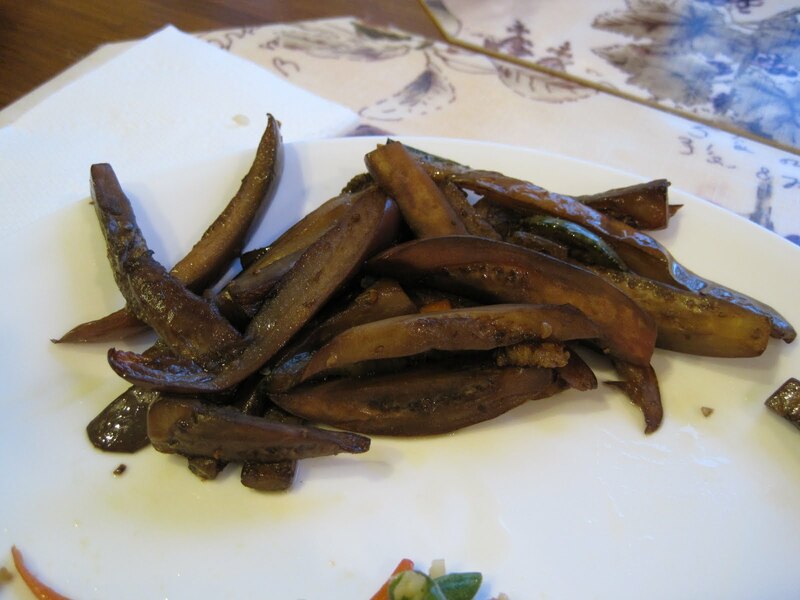 SP stir fried the CSA eggplant: And we made fried rice. For me, white rice with farmers market green beans, eggs, CSA carrot, and shrimp. 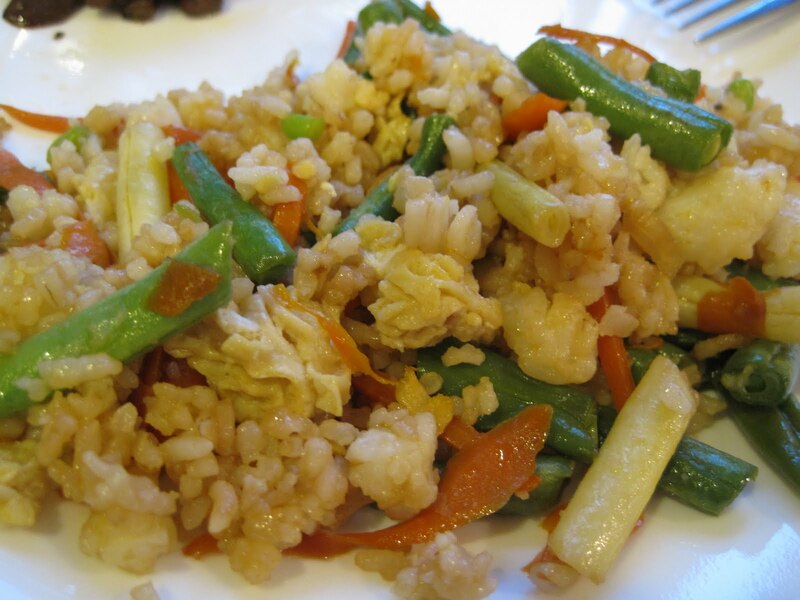 For SP, brown rice with the same ingredients plus some cabbage, celery, and leeks. It was kind of a 'clean out the veggie bin' fried rice! I have no idea what else we'll be eating this week. We are slowly cleaning out the refrigerator and freezer. We just tossed some meatballs we found in the freezer from last September! The veggie bin is empty and ready for the fresh CSA veggies arriving later today. I'm still feeling kind of polluted after a weekend filled with too much salty and sweet foods so I think there will be an emphasis on veggies for a while!